Scheda: Nazione: Canada-USA - Produzione: Insight Film Studio, in associazione con Cinetel Films - Distribuzione: RHI Entertainment, The Sci-Fi Channel, Splendid Film - Soggetto: Jason Bourque - Sceneggiatura: Jason Bourque - Fotografia: C. Kim Miles - Montaggio: Christopher A. Smith - Art Direction: Joanna Thompson - Scenografia: Renee Read - Set Decoration: Jon Tiffin - Costumi: Shela Bingham - Musiche: Pinar Toprak - Effetti speciali: Lux Visual Effects - Formato: Color, film tv - Durata: 89'. Cast: Nick Chinlund, Erin Karpluk, Elaine Miles, Barry Corbin, Tinsel Korey, Simon Longmore, John Shaw, Karen Austin, David Lewis, Don S. Davis, Dave Ward. Trama e commenti: mymovies.it - davinotti.com - filmscoop.it - cb01.tv - filmtv.it: «Gli abitanti di una cittadina dell'Alaska scoprono di essere minacciati da una creatura mitologica e spaventosa: durante una battuta di pesca, un uomo viene divorato da quella che si rivela una viverna, una sorta di dragone che non può sputare fuoco ma non per questo è meno letale. Il paesino è completamente isolato, e la popolazione locale si rende presto conto che dovrà vedersela contro il temibile mostro senza alcun aiuto dall'esterno...». Plot Summary, Synopsis, Review: IMDb - allmovie.com - dreadcentral.com - talkofhorrors.blogspot.it - filmcriticsunited.com - popcornpictures.co.uk - tarstarkas.net - best-horror-movies.com - thevideovacuum.livejournal.com - moviereviews.noskram.com - slashershouse.com - rottentomatoes.com: «In this creature feature from the SyFy Channel, Nick Chinlund (The Chronicles of Riddick stars as the resident of a small Alaska town that finds itself under attack by a flying dragon -- known in medieval mythology as a wyvern -- that has thawed from its ancient slumber by melting icecaps caused by global warming. Bolstered by impressive special effects, the fantasy-horror film also boasts a strong supporting cast that includes Northern Exposure alums Barry Corbin and Elaine Miles, as well as Don S. Davis (Stargate SG-1) in one of his final roles» (Sandra Bencic). en.wikipedia.org: «The small Alaskan town of Beaver Mills is located just north of the Arctic Circle, meaning that the sun does not set during the summer solstice. As the town prepares for its annual celebration of this event, a wyvern is awakened by the melting of the ice caps, and attacks a fisherman. Jake (Nick Chinlund), a handyman fixing the cafe where Claire (Erin Karpluk), hurts his hand and David (David Lewis), the town's doctor, examines it. While driving back to town, David is attacked by the wyvern. 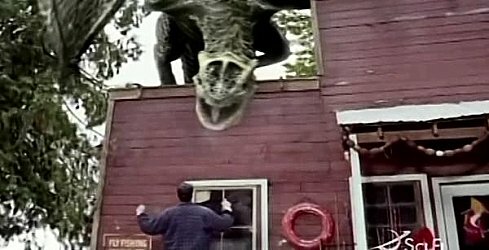 The next morning, Sheriff Dawson (John Shaw) and Jake hear gunshots and find Haas (Barry Corbin), a redneck attacked by the wyvern. 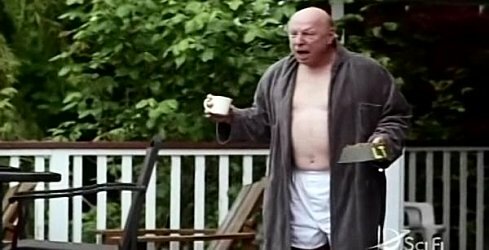 Colonel (Don S. Davis), who has seen the Wyvern, goes to town to warn the citizens; but they disbelieve him, and he goes to kill it. Dawson radios to his Deputy Susie (Elaine Miles) to watch the town, but fails to convey his meaning. Dawson finds his friend dead, and returns. At the town, the wyvern kills Susie and several other people. Jake, Claire, Haas, and the eccentric Edin (Karen Austin) take shelter in the cafe. Later, Hampton (Tinsel Korey), who runs the town's radio, and Farley (Simon Longmore), another citizen, hide in the cafe. 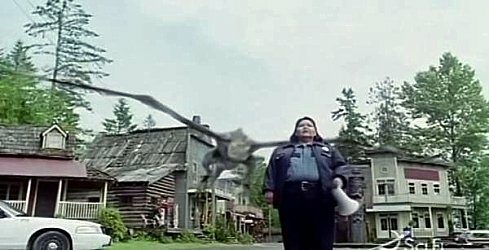 Sheriff Dawson is killed by the wyvern. Jake and Claire track the wyvern into the woods, where they find the Colonel, and discover the wyvern is killing anyone on the Interstate. Farley is injured trying to get supplies. The wyvern then uses David, still alive, as bait to draw people from the cafe. 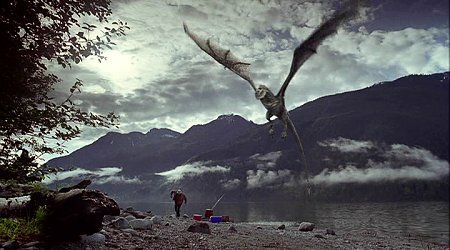 Jake goes to rescue him, and Farley distracts the wyvern to save them, but is eaten. 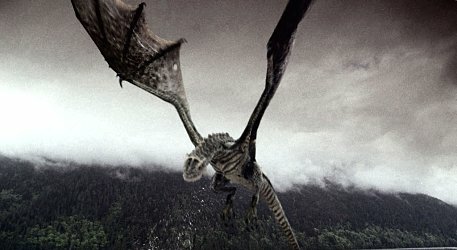 David tells the group the Wyvern has eggs, and dies of his injuries. 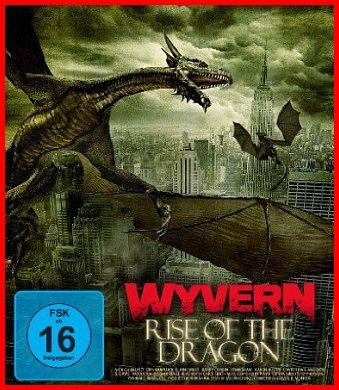 The survivors decide to electrify the nest, but the wyvern kills Haas. 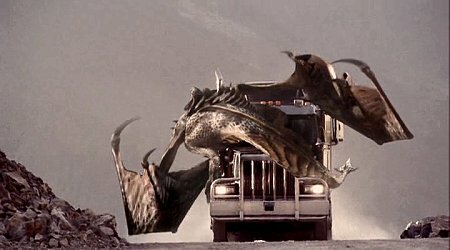 Jake takes a truck left on the side of the road and, using the eggs as bait, kills the wyvern. Jake, Claire, Colonel, Hampton, and Edin try again to radio for help». 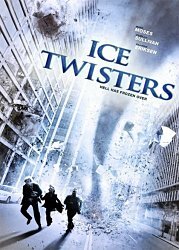 Conosciuto anche con i titoli: Dragon; Ice Twisters; Last Dragon; Wyvern. Die Rückkehr der Drachen; El ataque del dragón.